1995 marked the first year The Rock (formerly The Wedge) opened its doors in Tacoma, Washington. 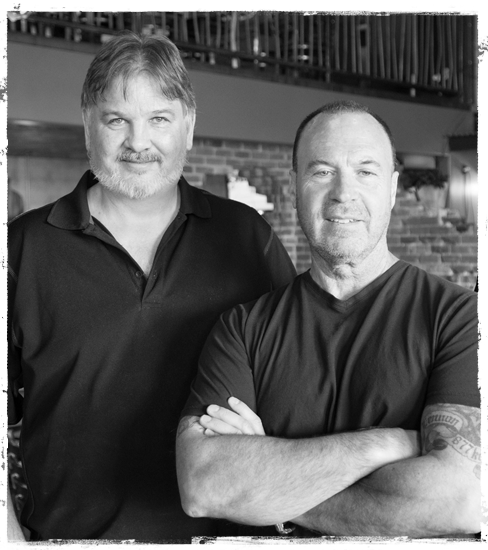 Founders, Don Bellis and Jay Gigandet, started the concept after enjoying wood-fired pizza in an establishment in a small New England coastal town. Both felt that Washington could use a wood-fired pizza establishment of its own. The duo insisted that their pizzas would be made from scratch, with only the freshest ingredients. While they were hard at work in the kitchen, their favorite Rock n’ Roll classics would accompany their pizza creations. What better way to enjoy your work than listening to your favorite music? “Turn it up!”, the crew and guests would yell from the dining room. And so it began; The Wedge became The Rock. The Rock’s unique atmosphere gained recognition throughout Tacoma and South Seattle as the venue where everyone could bond over their love for music, gourmet pizzas, special microbrews, and of course, Rocktails. After over 20 years, we can proudly say we’re still that same local pizza joint, just with more locations throughout Washington, Oregon, Colorado, and Texas. At The Rock, you will feel welcomed whether your are visiting us for lunch, dinner, happy hour, or happier hour. Or maybe just to swing by and say hello to friends. Our rock-inspired menu and full-service bar are sure to keep you, your friends, and your family coming back for more!